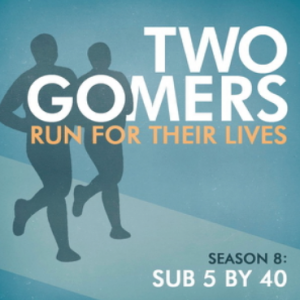 Spring has sprung, and change is in the air – including an unusual amount of semi-educated running talk from the unlikeliest of semi-experts: the Gomers. What’s happened exactly is unclear, but listen as they blame everything from their gadgets to their training program to actual miles put in – whatever it is, it’s kind of weird. But not as weird as Alan Silvestri’s score in Predator. And make sure you stick around for a Gomer Gear/Eat and Run/Gomer’s Tip UPDATE, two new Songs to Run To, the Week in Preview, and at long last, Anthony’s last supper revealed. Happy Running! I would definitley encourage you to follow Jeff Galloway’s advice about taking structured walk breaks throughout the marathon. It helps break the marathon into manageable chunks and actually delays muscle fatigue by giving them a break to recover while walking. Don’t fall into the trap of scrapping your plans during the marathon itself. Have a plan of when you’ll be walking and for how long. Also plan your nutrition and fluids. Its easy in the excitement of the marathon to skip walk breaks and water stations if you’re feeling great, but you will pay at the end. I can’t tell you how people go out much too fast and reenact the Bataan Death March the last 6 miles as they watch their time goals slip through their fingers. Train consistently and run your race and you’ll do great! As a consistent runner of 6 years in your same age group I assure you that your hard work will pay off. I just wanted to throw out a recommendation to Steven to try Hammer Gel. I was a die hard Gu user until I tried the Hammer gels. They aren’t as thick and cloying as the Gu. I would always have to mix the Gu with a mouthful of water to get it down but with the hammer gels, I can swallow it without any water. I stick with the raspberry flavor. yum! Anyway, just a suggestion. I really enjoy your podcast. Your story of running with all the sorority girls was hilarious. Keep those podcasts coming.